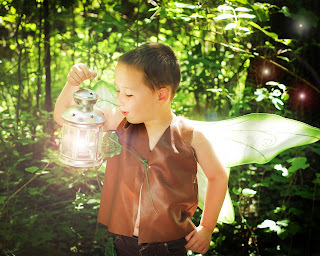 Our Event Date is Sunday August 16th 2015 - We are offering a limited amount of morning sessions for this date (unless they get filled) - If you wish to book a PRIVATE (Private sessions can take place on Sundays or weekdays) session please contact me at shadylanestudios@gmail.com - The pricing for a Fairy session for 1 child is DIFFERENT for a private session, please see pricing below. 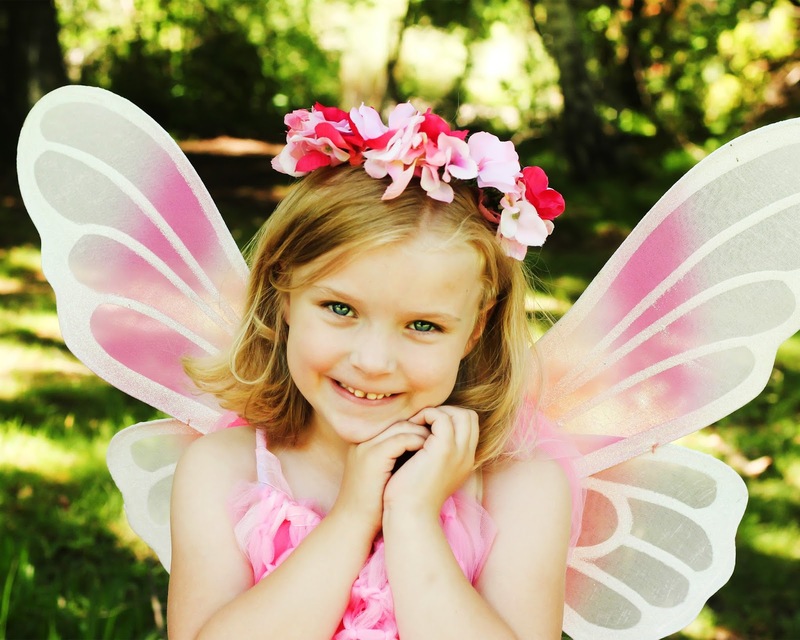 We have THREE different Fairy Packages to choose from this year. 5 FIVE (print to 8x10) digital images - they will be emailed to you. You will receive a CD with your print. Choice of either a 3x3 wallet album, silver photo bracelet or dry erase board. Additional Portraits will be available to add on when you view your gallery of images. Pricing for additional images starts at $30. Keepsake Albums start at $99. If a Mother would like to also be a Fairy I need you to book at least 2 weeks in advance so I can make a costume. Currently I have Purple and Brown for Mommy sized Fairy skirts. Please let me know WHO will be photographed and their age and what package you want. Once you have emailed me, I will send you an invoice via PayPal.com for the package chosen. There is $10 mailing/delivery fee- Your appointment is NOT set until payment is received. If you need to pay by check or Cash, We can meet at my studio by appointment. 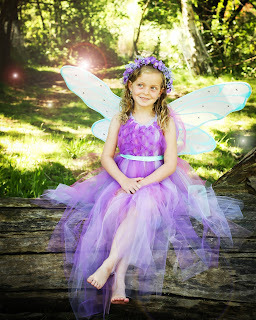 This is our 8th year of photographing Fairies - and they book up VERY fast! Please email me shadylanestudios@gmail.com with any questions! 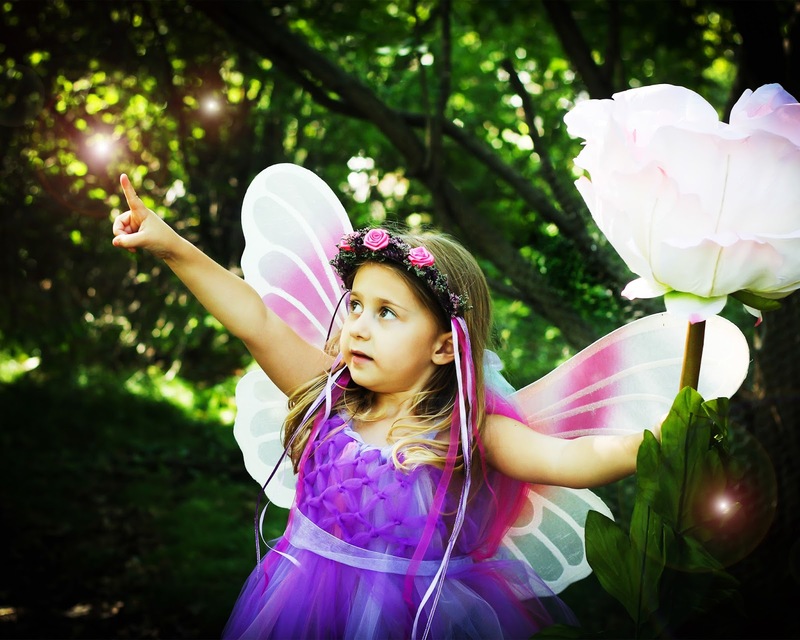 How old does my child have to be a fairy? 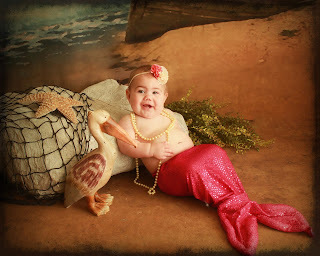 For Portraits ALONE, I recommend the child be old enough to sit unassisted. For with an older sibling/parent - I can do 4 weeks and up. What color dresses are available? What sizes are your dresses? what if you don't have my child's size? 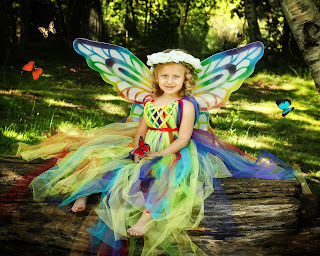 I will create a dress that will fit you child for their session. I need to know at least a week in advance to create a dress. 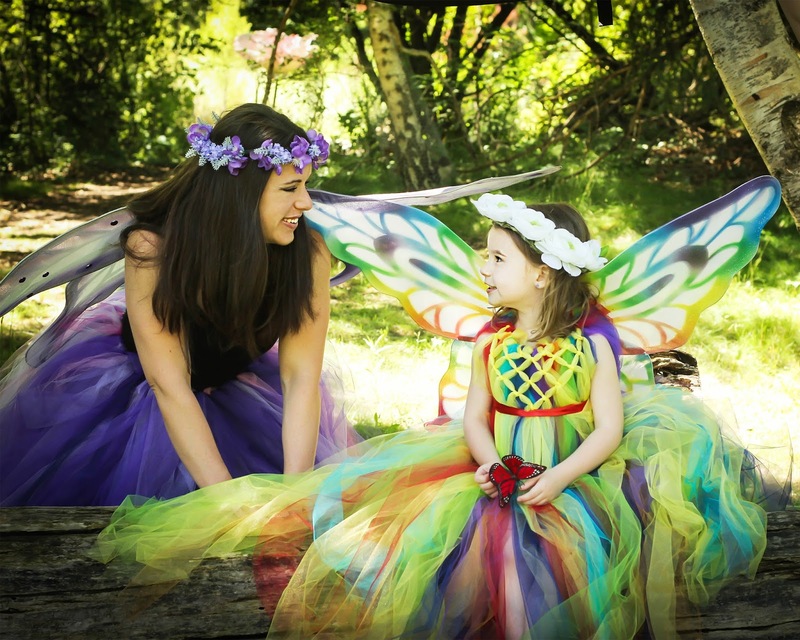 Most of our dresses are adjustable for several sizes, and we do have infant dresses/wings. For Infants I have a pink dress and a purple dress. Can Mom's/Older Sisters/Aunties/Grandma's be Fairies too? 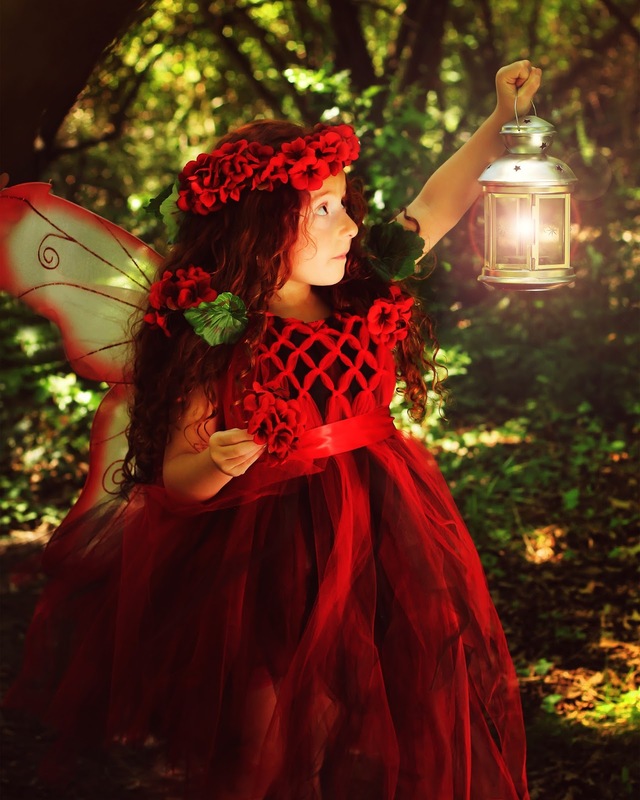 Yes - We provide the fairy skirt and adult wings. You will have to provide your own top. Currently we have a brown/multicolored skirt and a purple skirt in adult size. 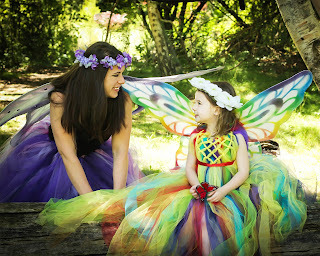 All Fairy dresses and most headpieces are created by Lala (the photographer) - some of our new headpieces are from a vendor. Our wings are from a variety of vendors. Can I buy the costume my child wears? Larger sizes can be created by request. You must also book a fairy session to purchase the costume - I need at least 2 weeks notice to create a costume, the wings will come from a vendor out of state. 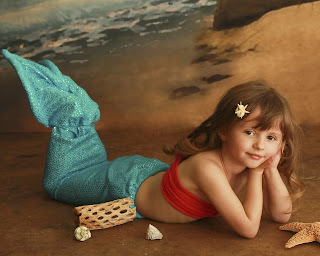 What little girl doesn't love Mermaids? Now, they can have their own mermaid portrait ! Right now when you book a Mermaid Session - each girl will be choosing the color of their tail and top - and they will be able to take their costume home for dress up after the session! 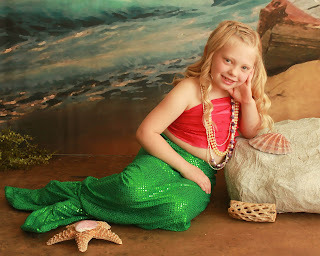 Costume includes 1 (2 piece) mermaid tail, top, hair flower, and 1 shell necklace. 30 minute Mermaid session (costume provided) with a variety of looks. Includes 5 Digital images on CD to print up to 8x10. Includes 8 Digital images on CD to print up to 8x10. 1 11x14 portrait (can be a collage) or 3x3 wallet album. There is no obligation to buy more. Once you have emailed me, I will send you an invoice via PayPal.com for the package chosen. There is $10 mailing/delivery fee. Your appointment is NOT set until payment is received. If you need to pay by check or Cash, We can meet at my studio by appointment. Our Baby's First Year Package includes a Full Session for Newborn and Family within the first 2 weeks of life, plus 4 "Milestone Sessions" - See what is included in a milestone session after the newborn package. This package is $699 due at the time of booking. We will send you an invoice via PayPal - If it is more than 4 months til your due date you may pay 1 half at the time of booking and 1/2 when baby arrives. *Not valid if you are doing a Black Friday Deal/Christmas in July. Referral Credits or Referral Coupons can be used on this session. If you need to do your family portraits on another day, or would like to add pets -this is included in your package fee. If you would like us to come to your home for the NEWBORN session (Boise, Meridian, Eagle - ask if you need us to travel farther) there is a $25 travel fee. It may be more if we have to travel more. Please Ask. Expect about 20-100 poses/images of your precious little one - alone, all snuggled up. In props or "set ups" - How many depends on baby's happiness - if baby is cranky, we will reschedule so you have the best portraits possible. If you CHOOSE not to be photographed with baby, you will have fewer images to choose from. This special does not include any Maternity Portraits or Extended Family portraits. You MAY do newborn with siblings on a different day - it's easier for the parents and myself! $699 due at the time of booking. We will send you an invoice via PayPal - If it is more than 4 months til your due date you may pay 1 half at the time of booking and 1/2 when baby arrives. *Not valid if you are doing a Black Friday Deal. Referral Credits can be used on this session. This Price includes your session - The time and talent of the Photographer, and the creation and editing of your digital proofs. You will receive a online portrait gallery within 2 weeks of your session so you may choose your images. It includes 1 Portrait Package below. Milestone Sessions usually take place at 3 months, 6 months, 9 months and 1 year old - HOWEVER, you have until your child is 19 months old to use your sessions. Sessions are a STUDIO session of Baby only. Outdoor is available depending on Photographer's availability. Milestone sessions are a $200 value each - this is an amazing deal! Milestone Sessions include the Session and 5 8x10 Digital Images - Printing release included. This special will expire on December 31 2015 You may pre-purchase it for a baby due after this date if you wish. Payment is due in full via PayPal or Check at the time of booking.There are no refunds so please be sure before purchasing, I am more than happy to meet you before the baby is born to go over what the packages include. I would reserve your session as soon as possible! "Won" Gift Cards are not valid with this already discounted session. If you have a referral (someone told you to contact me about newborn portraits) you will receive a special gift from me and so will the person who referred you! This is a IN STUDIO session only, and the session is for baby only. Expect about 10-25 poses/images of your precious little one - alone, all snuggled up. In props or "set ups" - How many depends on baby's happiness - if baby is cranky, we will reschedule so you have the best portraits possible. $299 due at the time of booking. We will send you an invoice via PayPal - If it is more than 4 months til your due date you may pay 1 half at the time of booking and 1/2 when baby arrives. *Not valid if you are doing a Black Friday or Christmas in July Deal UNLESS you are a CURRENT CLIENT. Referral Credits can be used on this session. This Price includes your session - The time and talent of the Photographer, and the creation and editing of your digital proofs. You will receive a online portrait gallery within 2 weeks of your session so you may choose your images. It includes Portrait Package below. Your images will be available for Digital Download, and a CD of images will come with your print. Additional Digital images are $20 Each. If you would like us to come to your home for the session (Boise, Meridian, Eagle - ask if you need us to travel farther) there is a $25 travel fee. It may be more if we have to travel more. Please Ask. $499 due at the time of booking. We will send you an invoice via PayPal - If it is more than 4 months til your due date you may pay 1 half at the time of booking and 1/2 when baby arrives. *Not valid if you are doing a Black Friday Deal. Referral Credits can be used on this session. This is for a NEWBORN (1-2 weeks old) Session with their parents and siblings to be held at my studio in Boise, ID. Newborn sessions focus on their sweet littlness and interacting with family. Expect about 15-20 poses/images of your precious little one - alone, all snuggled up. If you CHOOSE not to be photographe with baby, you will have fewer images to choose from. $499 due at the time of booking. We will send you an invoice via PayPal - If it is more than 4 months til your due date you may pay 1 half at the time of booking and 1/2 when baby arrives. This special will expire on March 25 2013. You may pre-purchase it for a baby due after this date if you wish. Payment is due in full via PayPal or Check at the time of booking.There are no refunds so please be sure before purchasing, I am more than happy to meet you before the baby is born to go over what the packages include. I would reserve your session as soon as possible! This special will expire on December 31 2012. You may pre-purchase it for a baby due after this date if you wish. Payment is due in full via PayPal or Check at the time of booking.There are no refunds so please be sure before purchasing, I am more than happy to meet you before the baby is born to go over what the packages include. I would reserve your session as soon as possible! We are currently accepting appointments for Maternity, Newborn and Baby sessions in September and beyond (August is booked). Fall is our busiest time of the year, so please book in advance! Limited sessions are available in November and December. Did you know if you do a session with us, and become a fan/like of our Facebook Page - that we will upload a your sneak peek there as well? It's easy to share your portraits with family and friends this way! Shade Photography) and Lauren Harms (Ooh La La Photography). Do not copy or remove. Violating Copyright Law is a Federal Offense.